Though the Philistines may jostle, you will rank as an apostle in the high aesthetic band, If you walk down Piccadilly with a poppy or a lily in your mediaeval hand. So you might think it would offer a pleasant walking experience. Wrong. 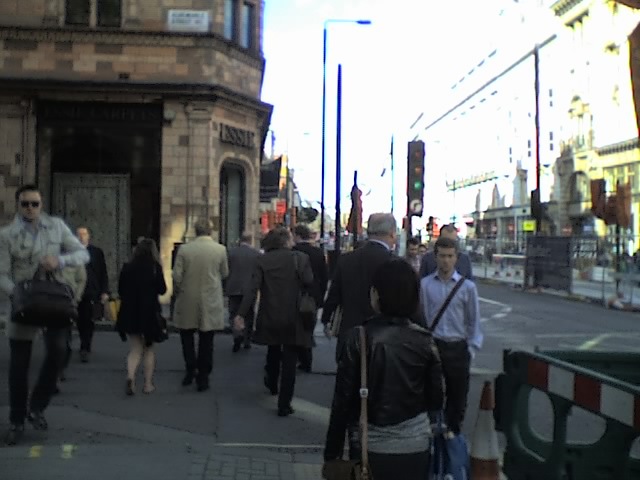 Piccadilly is, and long has been, a nightmare as a pedestrian thoroughfare, as I know from frequent use. One of London's key tourist routes, linking Green Park, Hyde Park and Buckingham Palace to The Royal Academy of Arts and Piccadilly Circus, Piccadilly is blighted by overcrowded, narrow, poor-quality pavements highly obstructed by railings and street furniture and with dangerous junctions with busy one-way side roads that are equipped with no proper crossings for pedestrians at all. 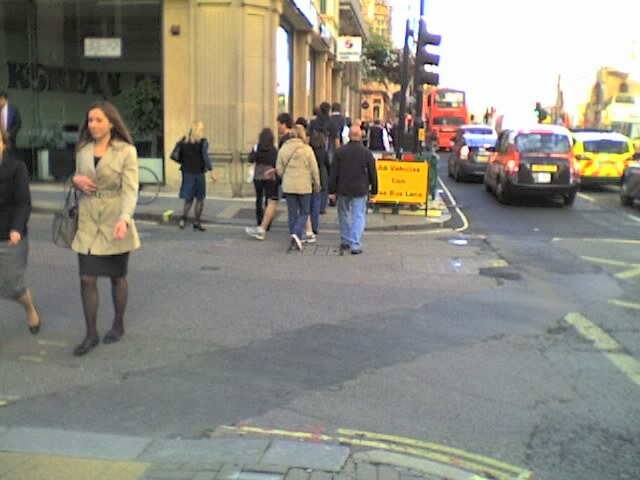 These junctions, where there is no pedestrian signal phase on which to cross, and where the traffic all comes bombing down suddenly from one direction, particularly at St James Street/Albermarle Street, which is the A4, where two lanes of traffic unexpectedly come bombing across Piccadilly from the south, are highly confusing and dangerous to tourists, and indeed everyone. At the moment the City of Westminster and TfL are doing some work on the roadway in Piccadilly to restore it to two-way operation for general traffic, and installing a central strip. This is supposed to be something to do with the Olympics: one of Boris's flagship projects for "improving" a small number of iconic London streets by 2012. Now, this change can be interpreted as be positive for cycling, though it is not very positive. No real cycling infrastructure (as usual) is part of the plan. 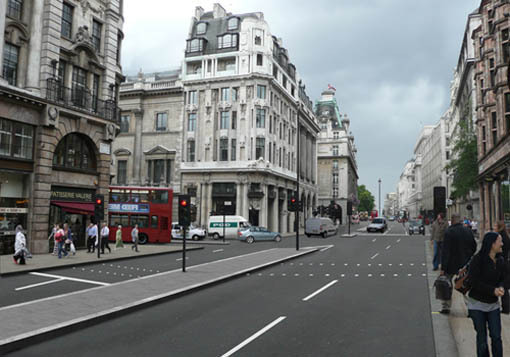 The change will offer some new route possibilities for cyclists in the West End and remove what the Evening Standard once called, memorably, the "Piccadilly Bus Lane of Blood", which was contraflow and segregated, but too narrow to be shared by bikes and buses. However the new route possibilities will by and large also be open to motor traffic, so there is no preferential treatment or prioritising of cycling going on here. 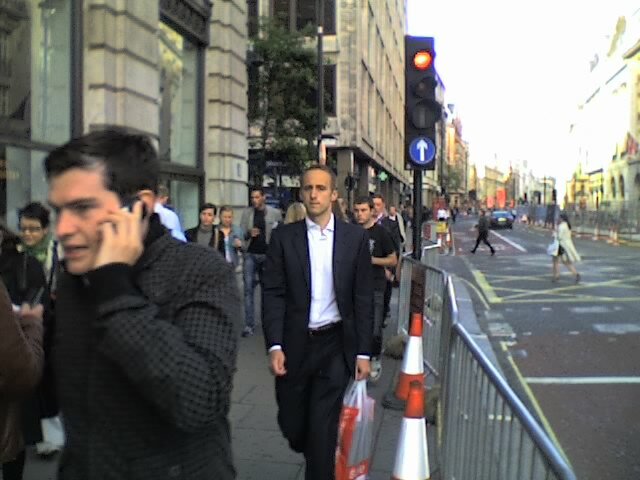 The benefits for cycling are therefore dubious – there may be a permeability gain which is balanced by a worse environment from even more and faster motor traffic, bearing in mind the increased space cars will gain from the removal of bus lanes which also seems to be part of the plan, though not clearly publicised. That is semi-protected space also lost to cycling, of course. Artists' impression of how Piccadilly should look when the works are completed. Note the complete lack of cycle facilities, not even advance stop lines, and also the waste of space in the middle of the road. Unfortunately, the plan seems to do little for pedestrians, who must be the vast majority of the traffic on this street. It is part of Boris's "Smoothing the traffic flow" agenda, which means maximising space for motor vehicles and minimising delays to them. Motor vehicles will get two lanes in both directions (except over one stretch where they will get three eastbound) and the bus lanes will be gone. There will be no cycle lanes. 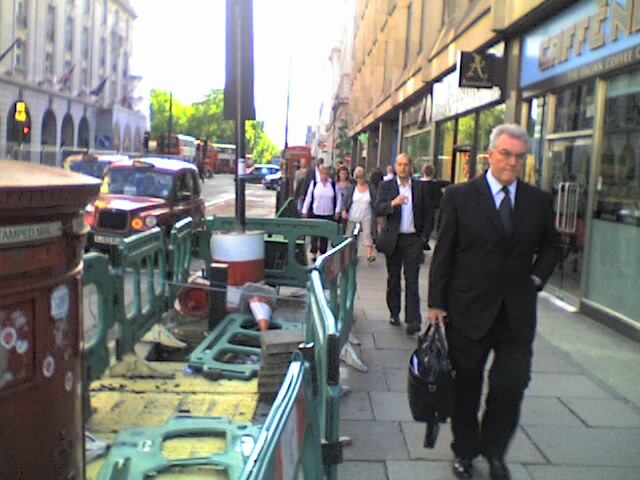 Pedestrians so far as I can see will be cramped on to the same inadequate pavement space they are now, albeit with removal of some railings. Look how narrow the pavement on the right remains in the artist's impression above. 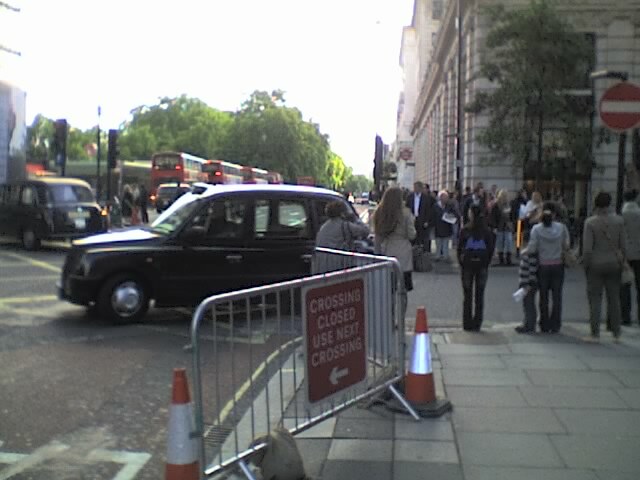 And why have they crammed in three lanes for vehicles beyond the lights (Albermarle Street), when only two are possible further east (towards the observer)? And note the absence of cyclists in the artist's impression. Nowhere for them to go in this scheme, it seems. Westminster's leaflet mentions "better pedestrian crossing arrangements" but it is not clear what this means. In the meantime, the works mean extra obstructions for pedestrians. For, if we need to store some building stuff, where do we put it, but on the pavement? Dover Street junction: no pedestrian signals. A sign aimed at drivers obstructs the pavement along with other stuff. Just look at those poor, patched road surfaces. These pictures show the key pedestrian section of Piccadilly between Green Park Station and the Royal Academy. It's a mess, and it was a mess before the present works started. It's always been a mess of obstructions and diggings. And this is supposed to be a showpiece London street, one of the most famous streets in the world. Tourists and other visitors to London are, most of the time, pedestrians. What impression do they get trying to negociate streets like this? I think they get an impression of an overwhelmingly poor-quality, neglected public realm. I think they will come away with the same impression even after Boris has re-done one or two selected streets in the West End and "smoothed the traffic flow". Central London's public realm is by and large a disgrace. Time to return to the suburbs. At the far end of the Jubilee line from Green Park Station, here's the pavement by Queensbury Station, in north Brent, after a bit of rain. At Queensbury Station. 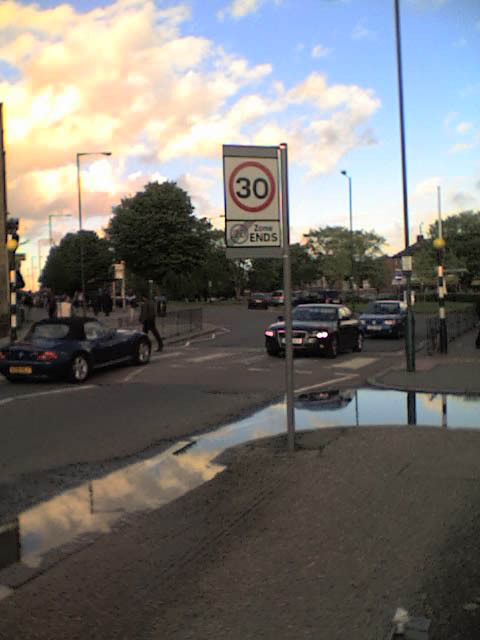 Why is the "30" sign facing the pavement? I think it is round the wrong way.